The R420r LED Lighting System redefines the term efficiency, with temperature controlled cooling system, utilizing highly efficient high intensity LED chips from Cree, drawing 130w of power but can out-perform 400w metal halide fixtures. The R420r Lighting system deploys an ingenious aerodynamic design which draws cool air from underneath the fixture, through its body which also serves as a large heat sink, to dissipate heat passively. Slim and Elegant: Built with a slim and low profile body, the R420r LED Lighting System is design to seamlessly merge into your living area with elegance. The R420r also comes with both pendant mounting kit as well as tank-top mounting frame, whichever suits you better. Photosynthesis: Photosynthesis is vital to almost all corals and plants on the planet, but they do not just need any kind of light, instead they require light in a specific ranges of spectrum in order to survive and thrive, namely the wavelengths that Chlorophyll A and Chlorophyll B require, as illustrated in the diagram to the left, since they are the two most dominant forms of Chlorophyll found in corals and plants. Enhanced Growth and Colouration: The R420r Lighting system is designed to provide all ranges of colour spectrum required by corals and plants to enhance their growth rate, improve their colouration and at the same time giving your aquarium the most aesthetically pleasing combination of colours. The R420r Lighting system also utilizes the 410/420nm Super Actinic LED chips, the spectrum that's crucial for the success of any reef and water plant aquariums as it is required by Chlorophyll A for photosynthesis, where absorption peaks at 412nm. The R420r Lighting system is designed to be primarily cooled passively, the body of the R420r is crafted entirely in aluminum, serving as a large heat sink, together with an ingenious aerodynamic design, cool air is channeled through the bottom of the fixture and heat will be dissipated through the aluminum chassis. With a built-in temperature controlled system, active cooling will be engaged as needed to ensure optimized performance. Photo-period Profile. With 6 Time-Points, users can program their own photo-period for their aquariums, fully control the intensity of light their aquarium will receive from dawn to dusk. Latest in LED Technology. 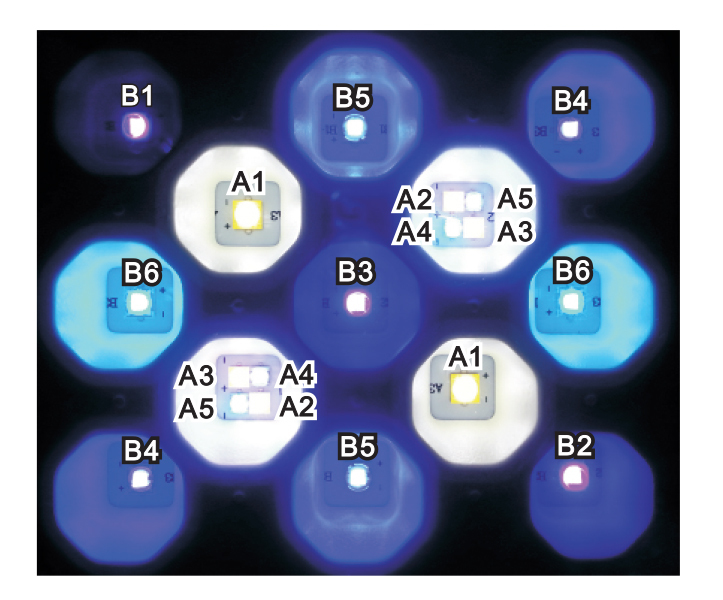 Utilizing the latest high performance high intensity Cree XLamp® XT-E and XB-D LED chips, equipped with 120° degrees optics, the R420r will consume less power yet producing more PAR (Photosynthetic Active Radiation) for even your most demanding corals. The R420r LED system utilize the latest in LED technology, including Cree XT-E and XB-D high intensity LED chips distributed in 2 different channels, offering unmatched performance and versatility. Alternatively just give us a call and we can let you know which is suitable. For grey or white label areas please call for a freight quote as there can be cheaper shipping options for these areas.